Andy Hui's character is based on real-life actor/action director Sam Wong Ming-Sing, who also co-wrote and co-produced Give Them a Chance. Wong is probably best known in the west as a Chinese soldier who fights Jackie Chan during the opening third of Police Story 3: Supercop. Also, the dancers did get their big break backing Andy Lau in his 2001 tour, but the veracity of the kids' soap opera lives is unknown. The Skinny: Admirable effort from director Herman Yau which wins points for an inspiring based-on-reailty tale, but loses points for uneven acting and somewhat cheesy melodrama. As movies go, this is only slightly above-average stuff, but the filmmakers deserve a chance for their earnest intentions. Back in 2001, action director Sam Wong Ming-Sing shepherded a young group of lower-class dancers into the semi-big leagues. Thanks to great effort and timely sponsorship, the troupe was able to display their hip-hop street dance stylings as back-up dancers in Andy Lau's summer concert. How do we know this? They made a movie on the subject. Andy Hui stars in Give Them a Chance as Sam, a movie action director working in Hong Kong's fizzling motion picture industry. Though he always wanted to be a dancer, he ended up in film, where he earns a small buck arranging stunts and kung-fu action. Through some small happenstance, Sam finds himself involved with a group of young street dancers, who practice their hip-hop stylings outside the Hong Kong Cultural Center. Sam feels an affinity for the kids, because their nighttime hobby echoes his former childhood dreams. Sam also has a brother, Jack (Osman Hung of band EO2), who teaches dance to disaffected youngsters in an afterschool club. However, Jack gets canned when he's seen street dancing at the cultural center with his students. Sam and Jack have been somewhat on the outs since Jack broke his leg while stunt-doubling on one of Sam's productions, but the brothers' renewed interest in danceand the desire shown by the youngsterslead them to found a non-profit dance club that keeps the kids off the street. 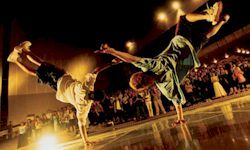 Eventually, the group gets a shot at the big time when they are selected to perform at a dance exhibition inside the Cultural Center. However, jealous yuppie types scheme to marginalize our lower-income heroes, meaning the kids may be denied their chance to impress family, friends, and maybe the rare star in the audience. Can they summon enough heart and teamwork to perform their four-and-a-half minute shot at stardom? And hey, isn't that Andy Lau in the audience? Whether or not these kids succeed is not the point here. The film was based on real-life events, and it's unlikely the film would have even been produced had evil yuppie types squashed the youngsters' dreams. Nope, this is your standard inspirational story about how determination and perseverance can overcome the proverbial hand you're dealt. That the whole thing is based on real life makes the film particularly endearing. It's hard not to root for a bunch of lower-class kids who simply want to give their dreams a shot. Not only were these kids kept off the street, but they turned their love of dance into a new life for themselves. Film producers anywhere would have taken note of that. However, the problem does exist: this is a Hong Kong Film. Hong Kong Cinema is renowned for wacky post-modern comedy or over-the-top action, but earnest, inspirational drama has never been its strong suit. Director Herman Yau seems to handle the drama decently, and though the dancing isn't that inspirational (the emotional energy of dance is better served live than on replay), he treats his characters and the subject with appropriate dignity. The kids' desire to dance seems genuine and not forced, and the chicanery of the educational system and the aforementioned evil yuppie types aren't rendered as complete caricature. Yau keeps the situations and his camera at a fairly realistic level, and the kids and their lives do feel somewhat real. It's a shame then that the film is written in such broad melodramatic strokes. The trials of the kids feature some hackneyed conflicts. Two brothers, one with kidney disease and one a mute, struggle with their broken family. They have a lifelong friend, who functions as girlfriend to one, and protector to another. However, she starts to fall for another dancer, whose older brother (Peng Wai-On, also of EO2) doesn't want his sibling to go down the wrong path. Add that to the other brother-brother conflict (Jack and Sam) and you have one helluva family mess. 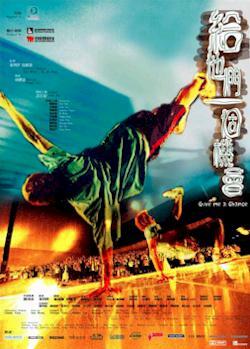 The Chinese title for Give Them a Chance translates as Three Pairs of Brothers. At least there's honesty in the title, but the convoluted interpersonal drama seems a tad too heavy for the film. Adding to this is the acting, which ranges from effective (Andy Hui and Peng Wai-On) to wooden (Osman Hung is as charismatic as a brick) to just plain grating (the kids are stiff or overact on occasion). There are some standouts, but by and large the acting is nondescript and even uninvolving. Most of the neophyte actors project poorly, which makes the hackneyed dialogue and conflicts even more glaringly obvious. The presumption is that the story is true, and the facts massaged to fit a more dramatic storyline. If so, then yay. If not, and the interpersonal issues were all added "drama", then they should have pared down the excess. At the very least, the "afterschool special" aspect of the kids' lives should have been toned down. There's a certain point where drama stops being drama, and becomes textbook clichés.